Many of you should remember about the hype  we observed about one year ago, when the images from the 8259 Mini-Bulldozer first appeared. Since then, I had the idea to repeat it in a planned manner. So, I made a proposal which was very well received and this year, with the sponsorship from the LEGO Technic team, we decided to launch a challenge based on the same idea. For an "official" (or should I say "sponsored") challenge, we are restricted to release models that do not include new parts. The only 1H2010 small model fitting this criteria is the 8046 (helicopter). So the challenge TBs has for you, is exactly that! Reverse and build your own LDraw reproduction from the 8046 main model. Even so, it does include some other parts not new, but still recent ones and not yet available from LDraw official library. Some were already added to the LDraw Parts Tracker (repository of not yet official parts submitted to LDraw Part Library) and some others were not. Luckily we got the precious collaboration from Philo, who have designed those missing parts for us and which he made extremely fast and very well done as usual. Thanks Philippe! Don't forget to download also the correspondent required subparts, or to make it easier if you prefer, to download and install the entire Unofficial Part Files at once. In case you have difficulties with the LDraw unofficial parts and need further help about this, you may find handy some of the recently tutorials here published at TBs [2, 3]. As in every contest, there might be some rules defined, that will help us also later, do determine who's the winner contestant. Reverse engineer and reproduce in LDraw format, the challenge proposed model. The reproduction should be exact (form, color, part list and type of parts used). Every contestant should submit their participation in the form of one LDraw file. Each submission must include one single model only. Contestants should also include one render image from their model, with a minimum resolution of 800x600. The contestants are allowed to submit two individual participations maximum. The flexible parts in the model should be reproduced accordingly. Reproduction should be as close as possible to the original. All the submissions must be sent by e-mail, to the TBs mailbox setup for the purpose of this challenge, with indication of the applicant identification (full name), postal and e-mail addresses. The winning participation will be the first sent submission, that exactly matches the: form (parts assembled in the same way), part list and colors from the LEGO official model being reproduced. If none submission fills all the criteria above, it will be selected the first submitted that gets closer to the different criteria with this order of importance: form reproduction, part list, color reproduction. All the submissions must be sent to the mailbox above indicated, before the 15th of November 2009, 24:00 CET *. The organization reserves the right to extend the participation period, if there is a reasonable justification for that. Results are expected to be published on CW51 (before Christmas). 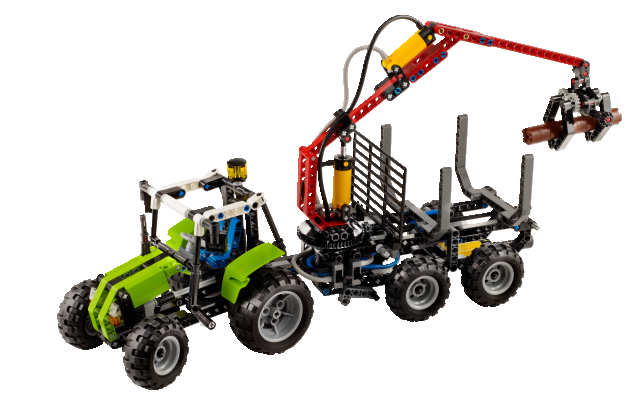 The winning submission will be awarded with a set sponsored by the LEGO Technic team. The prize will be the 1H2010 sensation (8049, Tractor with Log Loader) signed by Lars Jensen who is the LEGO designer author from this set. There might be something additional as a surprise for you, but I'll keep it for a later opportunity. At the event of any possible leak with further credible details about this model, during the participations submission period, any posterior submissions will not be considered for this contest purposes. Any eventual issues not foreseen in these contest rules, shall be evaluated and decided by majority of the TBs editors. And do not forget... this unique prize can become yours. Nobody made any comment yet ? I am not used to LDraw and so I am just trying to build with real bricks now. Every participants cheer up ! Ah - great, thanks! I assume that the one that is the most accurate representation of the Helicopter wins - but what happens if for some reason you get two alike or equally accurate entries? A explained in the rules, wins the first to present an EXACT reproduction. If none, then wins the one getting closer, based on the criteria written. Flexible parts not modeled correctly, does not count in the reproduction criteria. It **LOOKS** exactly right, but there are a few details that are impossible to determine from the pictures since there is only one angle. That means I had to guess and we'll see who guesses closest to right! Oh well, I don't have a chance at this. I look forward to the next (building themed ;] ) challenge, though! i guess TLG confirm the winner then.. or does TB have the actual set? Submitted my entry as well. It's quite hard though to tell/guess how the winch is attached. I tried the best I could, but if it's right? No clue to be honest. TB do not have the actual set yet. But will receive the instructions, in the beginning of December. So till then, there is no chance to know who have scored it, or not. Can you post the building instructions when you get them? Probably I'll get them in paper, but otherwise and if I get permission, I'll share the file. Nevertheless it shouldn't take too long after that, for TLG to make them available, as it has happened lately. Your 3L axle with stop has the wrong color. I realized there might be an issue with this yesterday, after publishing the post. The fact is that we are not yet sure about the color, and must think about an exception to deal with this. In fact I should add to the regulations something like: "Any eventual issues not foreseen in these contest rules, shall be evaluated and decided by majority of the TBs editors". nothing guaranties the others, that the options and guesses from Blakbird, are the most accurate. "Nevertheless it shouldn't take too long after that, for TLG to make them available, as it has happened lately." I try to this mission. Thank you TB!! It is very funny mission. A very interesting challenge indeed. I won't participate since I know this contest for some time, and it would be unfair... but I built a physical model of the helicopter, I think I got everything except the key of this contest: the winch. I have yet to figure out a good solution! I tink also many people will forget the extra half bush that sits next to the thin 12z gear. I think the winch will be hold just by a bush on an axle ( rope goes through the bush ). 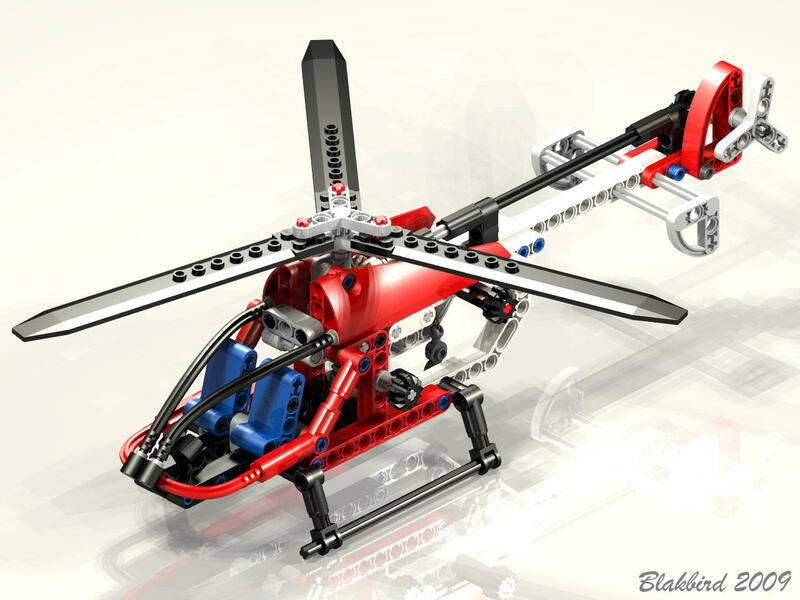 At first I couldn't figure out how the main part of the helicopter was done either, but in a way it builds itself. If you start by putting in the pieces you can see from the picture in your LDraw file, as you start rotating around you will see the ways the other pieces have to go in order for it to fit together. If you are familiar with the library of Technic parts, there is often only one obvious way it can work. It is a fun process! By the way - how on earth do you manage to make those photo-like renderings? I have tried just about every l3p option and nothing really helps. :? @Blackbird is that a deliberate error in your model? Are you trying to give others a chance? I won't point it out just yet! first, will we be penalised for slight misplacement of arts (I'm a newbie to MLCad) ie the pins don't fit exactly in the holes. Also is it okay to use 'dark grey' in place of 'dark bluish grey' and 'light grey' in place of 'light bluish grey' ? thanks. Yes the new gray colors maybe an issue with MLCad. For the purpose of this contest, both old and new grays, are Ok! The precise placement of pins is easy if you define an appropriate grid or enable it. Nevertheless small misalignments are behind the purpose of this challenge and may be accepted is my perspective. The methods I use for my renders are rather complicated and too lengthy to describe here. L3P (or LDview) is only the beginning. I also change the colors, the lighting, and use a High Dynamic Range probe. Maybe I'll do a tutorial some day! I did not make any deliberate errors. Now you have me worried!! Blakbird, I do myself see one eye-pointing defect..
You can also replace the colors in the color toolbar by right-clicking on the color (you might want to use this to change the old gray to light blu-gray and so on, I myself redid the whole toolbar! :) ) Also any part using stone colors (such as the Power Functions) will now appear in MLCad correctly! Apparently you guys have better eyes than me, because I stared at the photo and my render side by side for about 20 minutes, and I can't find any differences except that the rotors are rotated to a different angle and the winch is deployed a different length. first, what about the 3L axle with stud at the back, which we all know is a strange alien colour... what should we colour it? As Dryw stated today in the respective topic, the color is 'Dark Tan'. Nevertheless, this part will be accepted in 'Dark Tan', 'Dark Gray' or 'Dark Bluish Gray', since there was no sure about the color, when this contest started. GGGGGAAAAAHHHHHHH! I can't get this LSynth thing to work, the add command button is greyed out all the time! (This is the first full model in ldraw!) I've got the rest of the model built. I am trying but I don't think i'll get it in time. meh! Awsome render. At first glance I thought you just posted the actual picture of the set. Nice one! I meant to say this is MY first model in LDraw. I think the axle connecting the rear propeller looks like dark gray instead of black. I am sure this is just because of the lighting, but it may be the deliberate 'error' which Parax is refering to. After all, a dark gray 4L axle (without stop) would have to be a deliberate error. I've just updated the image link on the post. Actually I could do with a tutorial on how to install MLCad..
then i need to edit ini files..
Then perhaps I can start as long as I dont want the right colours... or to be able to rotate a piece, apparantly there is a helper that needs to be installed where this time?? then I notice I have two of some parts one of others.. sometimes two in different places! oh and a bunch of part not found errors. This software doesn't know the meaning of continuity! perhaps it needs some standards..
Argh! and I haven't started with placing pieces yet. sheesh was 15th Nov Long enough? LOL, maybe not enough for you this time, if you just started. I was reading through the comments, and saw that you don't actually have the instructions. There is a piece which I think would be used for the winch, but it has not been modelled in LDraw... I assumed that you guys had known the partslist and had had all parts modelled (like philo so kindly helped with the four parts mentioned), so I thought that it was not an option. I am also brand new to MLcad and it is indeed a mess although what do you expect for free !^). I have got it all working and I sussed the model out quite quickly. However after 4 days of trying I just can't get LSynth to work to finish the model. Thankyou Jetro for the link but regrettably i'm gonna have to give up on this challenge. Good luck to everyone else (and hope you spot that mistake blackbird!) 8^). squidster I had the same thought! I know exactly What Piece You Mean! but as its not there Im going to use a shorter version! Think about it! - or try and build it! it might even work better by adding friction!!! did I give too much away? I would include the optional use of the new part in your submission email! yes rotating a single part can be a nightmare! so group it with some others before you rotate the group. the Rotation Matrix resets when you create a Group so you can then rotate it more simply in just one dimension. Thanks, everyone, but.. I can't get LSynth working properly so I will have to give up on this challenge. I know it's a big ask, but do you think, for the sake of Al and I and others who are not that good with computers, could we just place the end pieces of the flex axles? Despite hardly qualifying for the prize according to the published rules (which hopefully you understand), of course your contributions would be welcome. At least I plan to publish all them here at a later phase, if not too much. @azarey Have you tried Wine? If you have followed the steps in the Holly-wood tutorial there's no reason why it shouldn't work. Make sure you set the absolute path to the location of your LSynth install in MLCad.ini and use quotation marks e.g. Actually now that I retried it (it has been months since I last tried), turned out that it's because I'm missing the Microsoft libraries mentioned on Clague's page. But the libraries won't install because "it can't find a proper volume for extraction". :? So... anybody knowing of a zip version of these libraries or anything? Nobody should have to quit the competition just because they can't get LSynth to work. If you have really tried everything and can't get it to work, feel free to send your file to me with the LSynth constraints in it. I will synthesize and send it back to you. I promise not to steal any ideas because I have already entered! Don't forget that even if you can't get LSynth to run through MLCad, you can always launch it from the command line. That's what I used to do. By the way, I have no idea what the "error" in my submission is, but I won't be changing anything. My entry stands as submitted. Thank you for your amazing generosity, Blakbird :) but mine doesn't even work to set up the constraints :( I suppose it would be cheating to send the model without any constraints? seconds after posting, I saw your error! since you have been so generous I will let you know. I guess I can reveal the error I noticed, then... the triple cross block (63869.dat) is the wrong way around. Ahh squidster.. you give it all away!! thats the one I had!! Go ahead and send me the file without the constraints. It will only take me a couple of minutes to synthesize the axles. Please not you will NEED the LS40.dat and LS41.dat parts from LSynth installed to even see the results. LDView will not download these for you. Make sure they are in your parts folder. The axle you refer to only looks black in the render because no light is shining in there. I can assure you that it is color 71 light bluish gray! I can't see anything wrong with the triple cross block. Blakbird that is a very generous offer but like sqiddster I can't set up any constraints or anything (I must have followed the tutorial to the letter 100 times, i'm just lost). For you to do anymore would just be plain cheating but thankyou very much. BTW Blakbird i'm not sure if it's the way you have rendered it but some parts, particularly the rear wing thingy, appears to be white and not grey like you intended it to be! By the way, what are these constraints I keep reading about? :? LSynth I did It My Way! from a mix of tutorials heres what I did.. Install Lsynth (here) I put it in C:\LDraw\Apps\LSynth - And the Visual C++ Runtime files! SAVE AND CLOSE THE MLCAD.INI!!! Then rescan the parts, this is important! To use the Flex axle you need to Add the command (Menu>Extras>Lsynth>Add Command>FLEXIBLE_AXLE) then use the Type 2 Hose Constraints! To use the String you need to Add the command (Menu>Extras>Lsynth>Add Command>STRING_HOSE) then use the Type 4 string constraints! You must have all the constraints between the SynthShow and SynthEnd tags in the parts List! BTW SAVE Frequently! and you'll redo Less Often! FINALLY I found that LDraw would not display the Lsynth Parts! and since I could not find an ldraw ini, I just copied them into the \Unofficial\Parts\s Folder which did the trick Ldraw could find what it needed and displayed the model correctly..
No Doubt I've done it all wrong! but it worked for me, so it might for you too. despite it is absolutely irrelevant from the assembling perspective, also the mold injection mark, is not modeled in LDraw parts. Must take a look into blackbird's file when I get some more time available (I'm going to setup a LEGO exhibition in the next few days). Wtf? The two sides of the triple cross block are not at all same - and the one in BB's helicopter is the wrong way around. You guys are certainly keeping me thinking!! Yes, I'm aware that some of the rear parts look white, but they are actually light bley. They only look that way because a light source is reflecting directly off of them. Here is a picture directly from LDView which should give you a better idea of the colors. Thanks for the image. I actually had no idea that this part was not symmetric. I guess I learned something new! In any case, I don't think part rotation counts as long as it is assembled correctly. Regarding constraints, these are the parts LS01-LS08.dat. These are used prior to running LSynth to tell it where the ends (or intermediate control points) of the flex part are. Most of the work is involved in getting these correctly placed. Glad you figured it out and thanks for posting those instructions. Luckily you only need to do the setup once. Also thanks for the link to the picture. As I mentioned earlier, this is just an artifact of the render. I checked the model file and it that axle is correctly bley. But the fact that these items are not really errors should not discourage anyone. I can think of one thing I messed up. There are a couple of parts which are hidden in the images which I made the wrong color. I forgot that TLG had made them a new "color coded" color recently and I made them the old color. Maybe this means I'll lose. I guess we'll see! Just an update on LSynth - there is no linux version available for the current version but once version 3.1 is launched (which should happen shortly) a tarball will be made available. I have just started using LDraw, yesterday, it is pretty easy, but I am killing myself with how to BEND THOSE FLEX AXLES!